Devoted to the Spiritual Philosophy, Polite Literature and General Intelligence, and all the Reformatory Movements of the Day. Suffrage for Women Specially Advocated. Be So True to Thyself as that Thou Be Not False to Others.—Bacon / The World My Country, To Do Good My Religion / Error is Mortal and Cannot Life. Truth is Immortal and Cannot Die / etc. Corporate author: Michigan Association of Spiritualists1/1, 1868-1873(?) $2.00 a year "invariably in advance." 4 pp, 19 x 26, 26 x 40; 5 columns of advertising, primarily for dubious medical remedies. In 1870 the journal was claiming a circulation of 4,000. The advertisement for the journal in the Index for April 9, 1870, describes it as "Devoted to the Spiritual Philosophy, Polite Literature and General Intelligence, and all the Reformatory Movements of the Day. Suffrage for Women Specially Advocated." 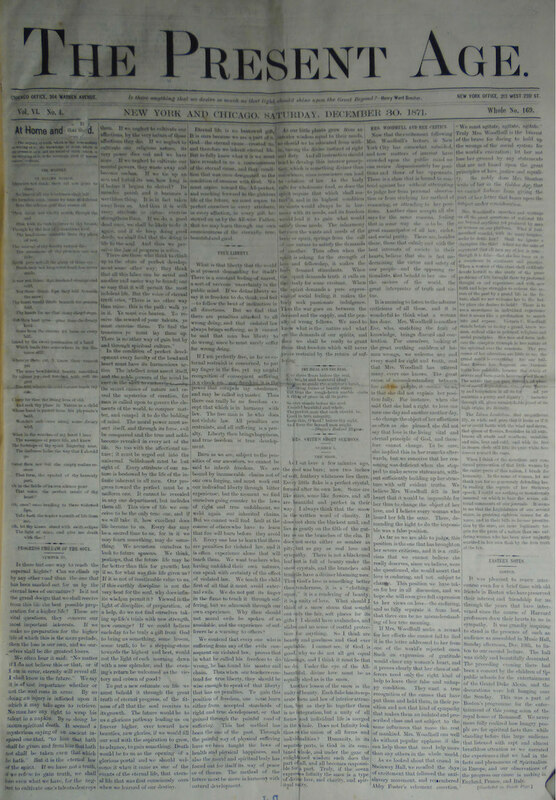 The journal ceased in 1872, but the Banner of Light for March 22, 1873, notes that it had resumed publication under D.M. Fox, with the veteran S.B. Brittan as editor in chief. The revived journal must have been short-lived. The journal, however, is still noted in Reformirende Blätter, February 1883, which may indicate that it was published until then. Regular articles by J.S. Loveland, E. Whipple, Hudson Tuttle, Mrs. H.F.M. Brown, Annie Denton Cridge, and others. The journal, as is apparent from its contributors and editors and the involvement of Dorus Fox, was decidedly on the radical side of the spiritualist spectrum. Featured a "Children’s Department" and various other local departments, and regular novels, including "A Search for the Temple of Happiness" by the medium Nettie M. Pease, who was to become Fox’s wife and an editor of the journal. Noted in "Journals Devoted to Spiritualism" in Year-Book of Spiritualism for 1871. An advertisement in the journal on August 29, 1869 for The Universe notes that the latter journal will thenceforth be called Present Age and Universe, which may indicate a consolidation. University of Rochester. Note: Volume 6 issues are issues originally owned by L. M. Severance, the medium.